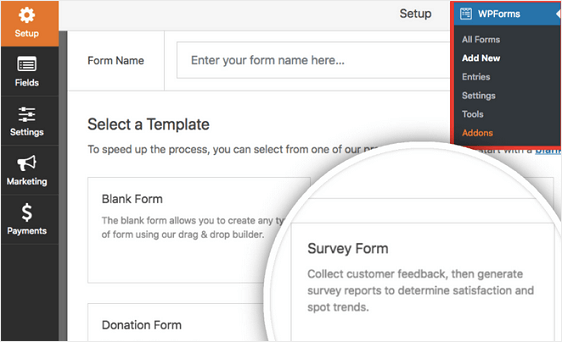 In this article, we’ll show you how to create a survey form in WordPress using WPForms. Why Create a Survey Form in WordPress? Survey forms let you gather important information directly from your target audience. This way you can fix things in your business they don’t like and offer more of what they do like. Gather Feedback. Surveys let people give their opinions, as well as voice their concerns, in an anonymous and safe way. This way you get honest feedback from those that directly affect your business. Start a Discussion. If you ask the right questions on your survey form, you’ll be able to start meaningful discussions about important topics related to your business, industry, and more. Stay Objective. Rather than base your business decisions on what your “gut” tells you, use a survey to get objective information from site visitors to make improvements. You can also prioritize issues using survey responses. Start a Comparison. By routinely conducting surveys, and asking site visitors the same questions over periods of time, you’ll be able to measure how their opinions, attitudes, and needs change. This can help your business evolve. Surveys are inexpensive to run, are flexible when it comes to the types of questions you ask, and are more dependable thanks to anonymity. Not to mention, when you use WPForms, and the Surveys and Polls addon, they are super easy to set up and run on your website. So, let’s take a look at how to create a survey form in WordPress. Next, you’ll need to install and activate the Surveys and Polls addon. To do this, go to WPForms » Addon and find the one labeled Surveys and Polls Addon. 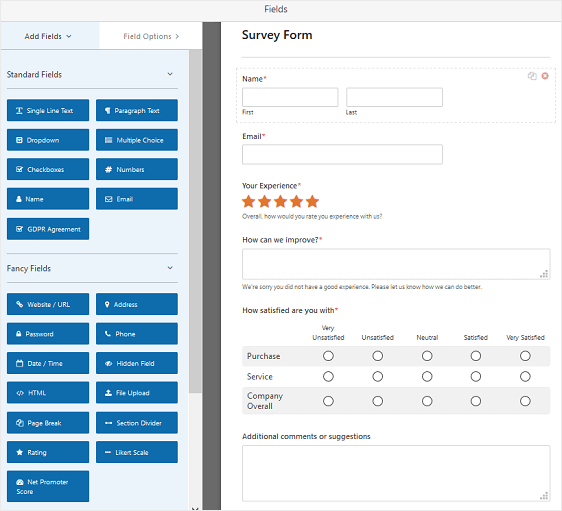 You can use any of the WPForms form templates and add survey questions to them if you want. In fact, you can check out our helpful tutorial on how to add a Likert Scale to any WordPress form if you want to measure your site visitors’ experiences or opinions on something like a simple contact form. However for our example, we’ll create a survey specific WordPress form. To start, go to WPForms » Add New, name your form, and choose the Survey Form template. WPForms will then create a survey form for you. This gives you a good framework to work with and can be customized depending on the types of questions you’d like to ask site visitors. You can add additional form fields to your survey form by dragging them from the left hand panel to the right hand panel. Then, click on the field to make changes. You can also click on a form field and drag it to rearrange the order on your survey form. But for now, let’s take a look at how you can customize your survey form’s Rating Field. To start, change the label of the field, add a description telling site visitors what they’re rating, and choose the scale, which can be between 2 and 10. Type. You can use a star, heart, thumb, or smiley face icon. Size. You can choose the rating icon to be small, medium, or large. Color. Use the color picker to change the icon color. If you are interested in getting more feedback from site visitors based on their rating answers, you can enable smart conditional logic. For help with this step, check out our tutorial on how to use conditional logic for ratings. Next, we’ll take a look at to customize the Likert Scale form field. 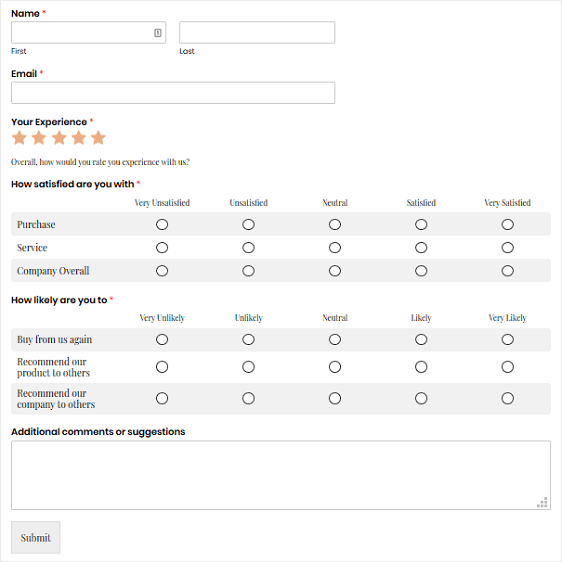 Customizing the Likert Scale on your survey form is done the same way you customize the rating field. All you have to do is click on it. For more details, check out this helpful documentation on customizing the Likert Scale field. If you want to take it a step further and calculate how your site visitors feel about your company using a Net Promoter Score (NPS), rather than a traditional survey form using a Likert Scale, be sure to check out this helpful guide on how to create a Net Promoter Score (NPS) survey in WordPress. When you’re all done making changes to your WordPress survey form, click Save. In order to receive the results of your survey form as site visitors fill it out, you need to enable survey reporting. To do this, go to Settings » Surveys and Polls. Then, click on the Enable Survey Reporting checkbox. This will enable survey reporting sitewide. If you used the Survey Form template, this option will be enabled by default. However, if you use another form template, and want to collect survey results, you’ll need to manually check the box. If you don’t want to collect survey results for every form on your website, unclick the Enable Survey Reporting checkbox under Settings » Surveys and Polls. 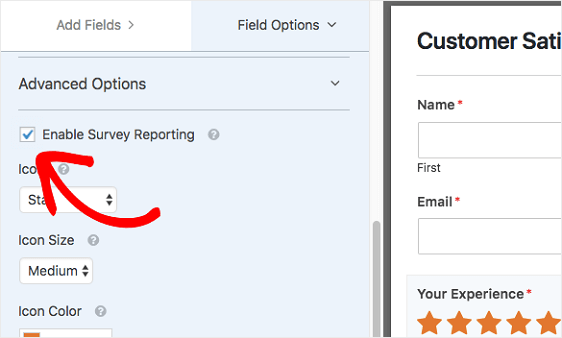 Next, return to the Form Editor, click on the field you want to enable reporting for, and under the Advanced Options section, check the Enable Survey Reporting box. Now only survey results for that particular form field will be collected. General. Here you can change the form name, customize the submit button, enable the anti-spam honeypot feature, and disable storing entry information and user details, like IP addresses and user agents, to further comply with GDPR. Notifications. To receive an email that someone has completed your WordPress survey form, you’ll need to set up form notifications in WordPress. If you use smart tags, you can also send a notification to site visitors when they complete your survey, letting them know you received it. Confirmations. Once site visitors complete your survey form, you can show them a message right after, take site visitors to another page on your website, or redirect visitors to another website altogether. 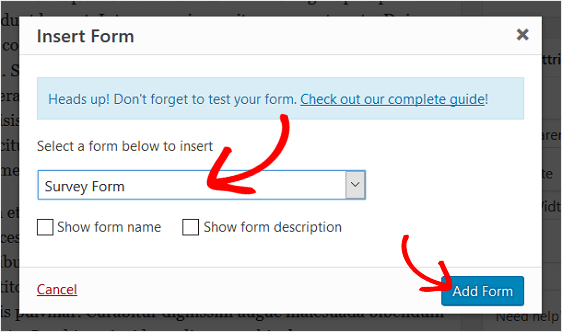 For help with this step, check out our helpful tutorial on how to set up form confirmations. After you’ve created your survey form, enabled survey reporting, and configured the settings, you need to add your survey form to your website. Next, select your survey form in the modal popup and click Add Form. Then, publish your post or page so your survey form will appear on your website. Once people start filling out your survey form, you can see any data that’s collected. 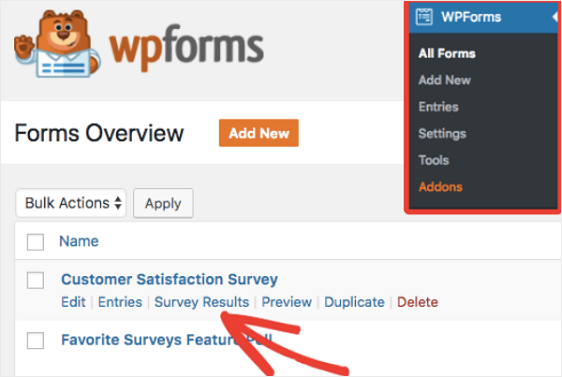 To generate a survey report, go to WPForms » All Forms and hover over your survey form to display the options. Then, click on Survey Results. You’ll see survey results for each form field that has survey reporting enabled on it. And there you have it! 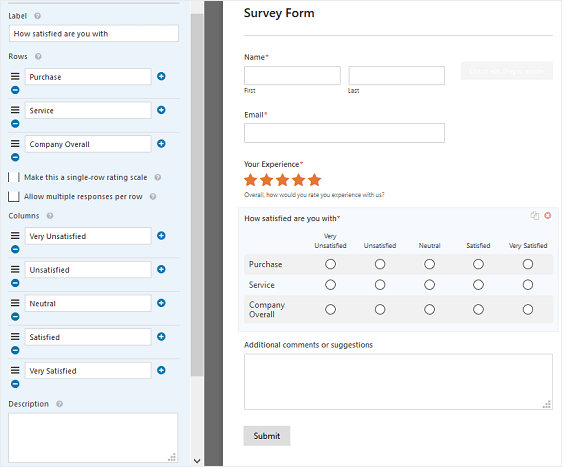 You now know how to create a survey form in WordPress so you can gather feedback from site visitors and use it to improve your business. If you’re interested in in only asking site visitors one quick question, be sure to check out our article on how to create a poll form in WordPress. And, if you want to really build your business, check out how to increase your survey response rates so you can offer the kinds of value propositions your site visitors really want.